TWVA is a virtual airline created for flight simulation enthusiasts, emulating the former Trans World Airlines. We have been around now for several years and are dedicated to enhancing your flight simulation experience. Whether you fly "online" for a realistic experience involving other aircraft and real-time air traffic control, or offline with AI Traffic, you will find a friendly atmosphere in which to enjoy your hobby. Apply today and let the fun begin!! These are current flights and flights completed in the last 30 minutes. There have been 1 user(s), and 64 guest(s) online in the past 20 minutes. Trans World Virtual Airlines is not affiliated with any real-world airline. It is for flight simulation entertainment purposes only. 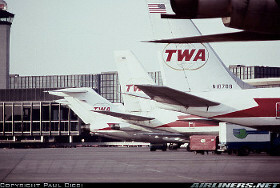 For information on TWA, please visit the American Airlines web site.